Google Drive is launched just few days and this new cloud storage has gained much popularity in such a short span of time. Dropbox and other cloud storage services has got one more competition. Normally, Google Drive, Dropbox and SkyDrive creates a folder on the hard drive and the user needs to copy and paste or drag and drop the file into this folder to upload and sync the file in the cloud. But this task of copy and paste may look repetitive after sometime. A much better solution is to add Dropbox, Google Drive and SkyDrive to the Send to menu. After installing Google Drive and SkyDrive, you will be able to see a shortcut to Google Drive and SkyDrive in the Desktop. 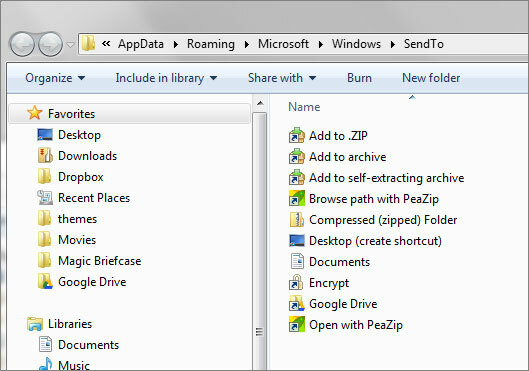 Users can easily copy and paste files in that folder. Now lets learn how to speed up the process of uploading files by adding this folder to Windows right-click “send to” menu. The advantage of using this method is that you can easily send any file to the cloud with a single click. Just right-click on Windows Explorer, go to ‘send to’ and then click on the cloud storage where you wish to upload the file or folder. Open the directory where Google Drive, SkyDrive or Dropbox is installed. You can access this directory from Desktop or from Favorites folder in Windows Explorer. 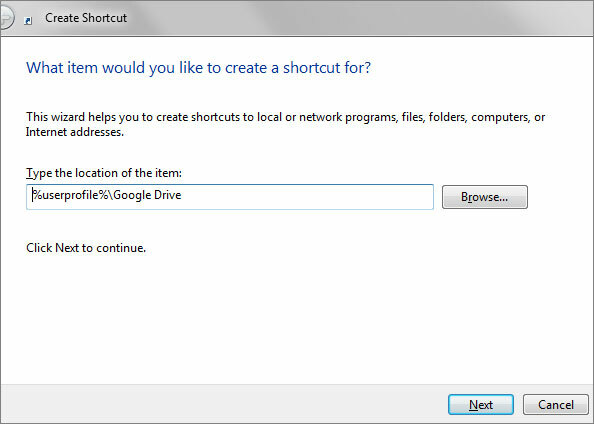 Right-click on the main folder of the cloud storage service and then click on “Create Shortcut” to create a shortcut. Open start menu, type shell:sendto and press Enter. Windows XP users can open the Run dialog box by pressing the shortcut key Windows + R and then typing shell:sendto. This should open a new Windows Explorer window containing all the items in your right-click send to menu. 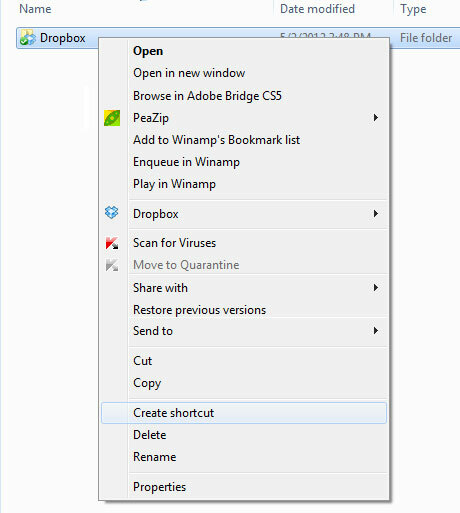 In this folder, copy and paste the shortcut which you created in step 1. You may wish to rename the shortcut. For e.g. 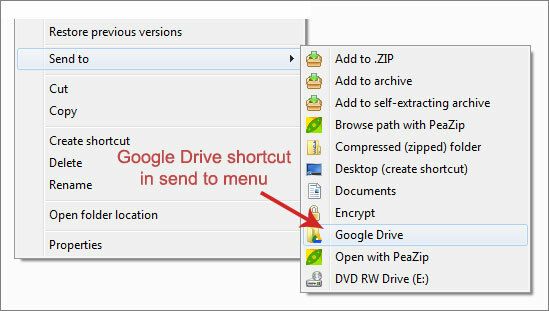 from Google Drive – Shortcut to just “Google Drive”. The name of this shortcut will appear in send to menu. That’s all you need to do. Now you can right-click and see that the shortcut is added to this send to menu. The above method is a very superb way to upload or send files to your cloud folder directly, in a single click. The same method can be followed for any cloud service that creates a folder on hard drive. There’s one more method to achieve this. After following step 2 (only step 2 and skip step 1), right-click on an empty space and click on New > Shortcut. In the dialog box, “Type the location of the item”, type %userprofile%\Google Drive (for Google Drive), %userprofile%\SkyDrive (for SkyDrive) and Dropbox users can click on Browse and locate their Dropbox folder. Click on Next and then type a name for this shortcut. Click on Finish to finish this process. That’s it, your shortcut is created. Now you can start sending files directly to your SkyDrive, Google Drive or Dropbox folders.